A Tamil citizen from Ilankai, who was displaced and lived in a refugee camp in Tamil Nadu, is said to be rendering great service to creative Tamil literature, and many if his works are being published in foreign countries, Mr. Ganesh said. The people in the Diaspora are operating several Internet websites where they promote the Tamil language by publishing their literary work, and many such sites contain high-quality literary work, he said. 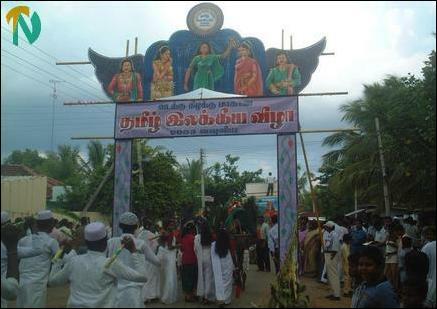 Prior to the commencement of the event, a procession carrying a statue of the “Tamil mother” started from the Vavuniya town and reached the Aquinas theatre of the Irambaikulam Girls’ school. 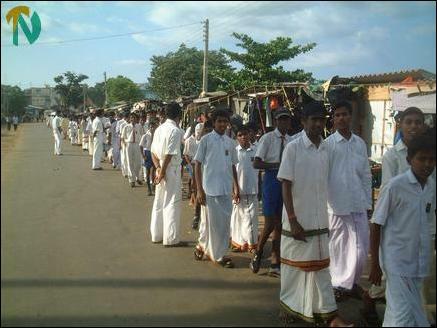 Tamil and Muslim students marched in the procession. Students made up to appear as ancient Tamil sages, such as Kamban, Valluvar, Auvaiyar, and more recent literary luminaries like the late Prof.K. Kailasapathy and Prof. S. Vithiyanandan, were seen marching in the procession. Ms.N. Srithevi, the deputy director of cultural affairs, presided over the evening events and gave the welcome speech. The evening program included drama, classical Tamil dance, folk dance, and musical programs.